I have been building custom guitars for more than 20 years. Initially I made acoustic guitars but for a number of years now I have dedicated much of my time to making custom electric guitars. When I started making custom electric guitars I was keen not to make high-end copies of other well known guitars. I wanted to make guitars that look distinctly different, use tonewoods that are not commonly used by the big manufacturers and sound a little different, with their own voice. My mission is to make custom guitars that look stunning, sound great, have their own distinctive voice, are really well set up and bring great pleasure to the owner of the guitar. If you look around this website you will see that I love using exotic hardwoods for body facings, such as; bubinga, paduak, macassar ebony, bocote and walnut. Once lacquered these tonewoods look quite stunning. 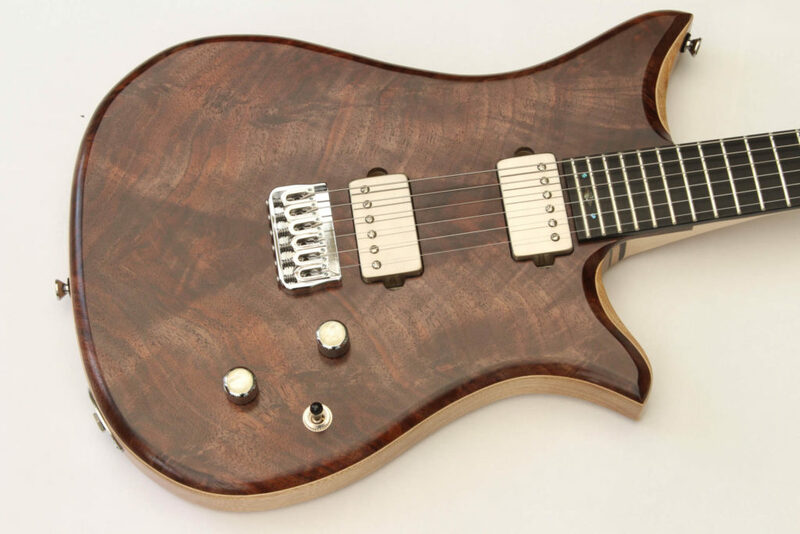 But my own concern about deforestation and use of tropical hardwoods have, in recent years, caused me to rethink the woods I use when building custom electric guitars. So, increasingly I am using non-tropical hardwoods to build guitars. But whatever the custom guitar is made of, ultimately it must play well and be a serious gigging guitar. So the attention to detail when constructing the guitar, the balance of the guitar, the choice of pickups and the setup are ultimately more important than how the guitar looks. But even better to have a guitar that plays really well but is also a thing of beauty! Why commission a custom guitar? Maybe you have owned a number of guitars and are looking for something a bit different. Or maybe you know just what you are looking for in a guitar and can’t get this from the big manufacturers. If so, this is where the custom guitar maker comes into their own. Whether it is a choice of tonewoods, neck width and thickness, scale length, pickup selection and switching options, I can make a custom electric guitar that is tailored to your specific requirements. So at the heart of each Flame Guitar is a conversation that has taken place between customer and maker and led to the creation of a unique and very personal guitar. I currently offer four models. These being the Flame F1 to Flame F4. Each of these guitars are slightly different. What I have tried to do is design and develop of range of custom electric guitars that may appeal to a range of playing styles and techniques. Rather than explain the differences here I suggest you explore the models page. The custom guitars you see displayed here are a starting point, and hopefully show the quality of my work. If the models shapes do not appeal to you (don’t worry, I wont take offence! ), but you would like to consider you own commission based around another body shape, I would be happy to discuss this. On my stock page I have guitars that are for immediate sale. Please also have a look at my gallery page to see a selection of custom electric guitars that I have made over the last few years. Please contact me should you wish to discuss the commissioning of a Flame custom guitar. "Now, where do I start? I haven’t been able to put my new guitar down since Sunday evening when I got home, it is easily the most beautiful guitar I have ever owned, and it plays fantastic, I can feel and see that a lot of care has gone into the build and set up of this guitar! I’m so glad I made the decision to get it, thank you again"